It’s been awhile since I finished a quilt this big! I blogged about this quilt top here. 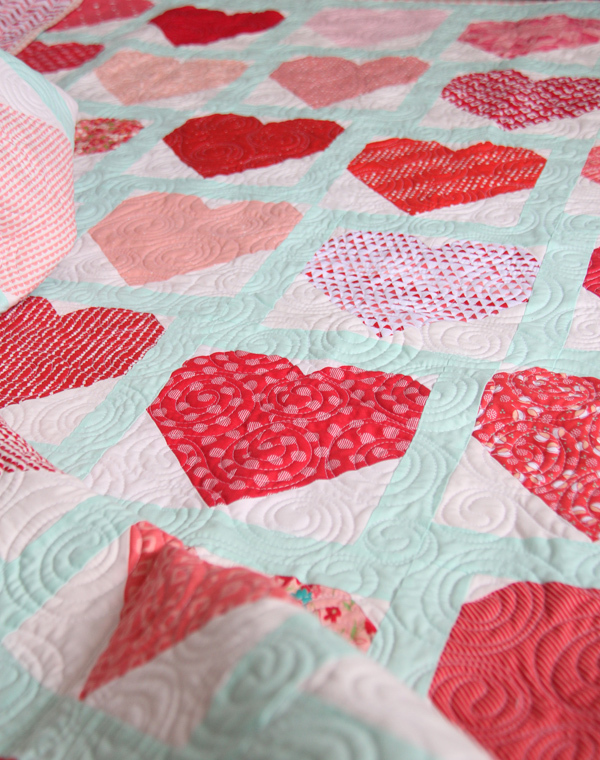 Tutorial for the heart blocks can be found here. It’s a large twin size, and after I finished the top I sent it to Kathy for quilting. She did a BEAUTIFUL job! I told her to do whatever is easiest…ha! She free handed all these beautiful swirls! I can’t get over the beautiful texture! It’s going to be amazing once I wash it…which will be often on my daughters bed. This summer it will be 10 years since I started this blog. I wonder how many photos of quilts I’ve taken in all of that time?! I don’t think I want to know, LOL! I do know that this blog has brought so much joy to my life, even if I don’t get to blog as much these days since my family has grown. Thank you for sticking with me all this time and taking time out of your days to read my posts and visit this blog. I love this quilt! And the quilting!!!! Love all those swirls. I think this one just may be on my list to try and make. Beautiful quilt. Just lovely!! Have a great day!! Enjoy your family!! Love this quilt and am amazed what you did with the different sashing color – it all looks beautiful. Congratulations on 10 years – so glad I found your blog :)! I’ve been enjoying it since I started to quilt a few years ago. Wow! That’s a great quilt, and the quilting is divine! I love all your quilts, but this heart quilt is really special. I love the variety of colors and the setting. Beautiful. Thank you for sharing with us for 10 years! Congratulations! Yours was one of the first blogs I began to follow when I discovered quilting blogs only a couple of years ago. You have brought such joy and fun into your blog – from the name, to the projects, to the wonderful colors. Thanks you so much for sharing your sewing life! 10 Years!!! Wow, that’s amazing :) And I am so grateful that you have been sharing your love of quilts and your beautiful pictures of them for years, it is a constant inspiration!!! Oh so sweet! Love how the hearts are offset – looks fantastic! Love this quilt….and your blog. So much inspiration. So grateful to you for all the work that goes into posts and “making”. 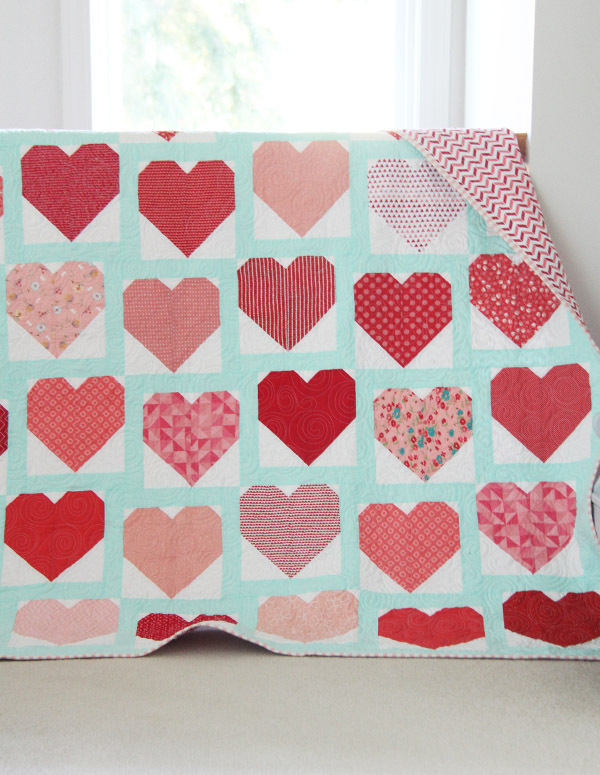 Love your blog and your heart quilt! Ten years?!!…Amazing! Thanks for sharing your love of quilts, beautiful quilts and precious children! Thank you!!! I started blogging with other readers of books, now I am auditing quilting blogs. I found you about 1 year ago and love your tutorials and tips. Thanks for your happy, happy quilts and your blog. Keep up the good work and sometimes it does get to be work.. I love your blog and your quilts! This is a great inspiration for a baby quilt I want to make! Beautiful! And congrats on 10 years. I started following you when your oldest daughter was born! And have bought a few of your patterns. 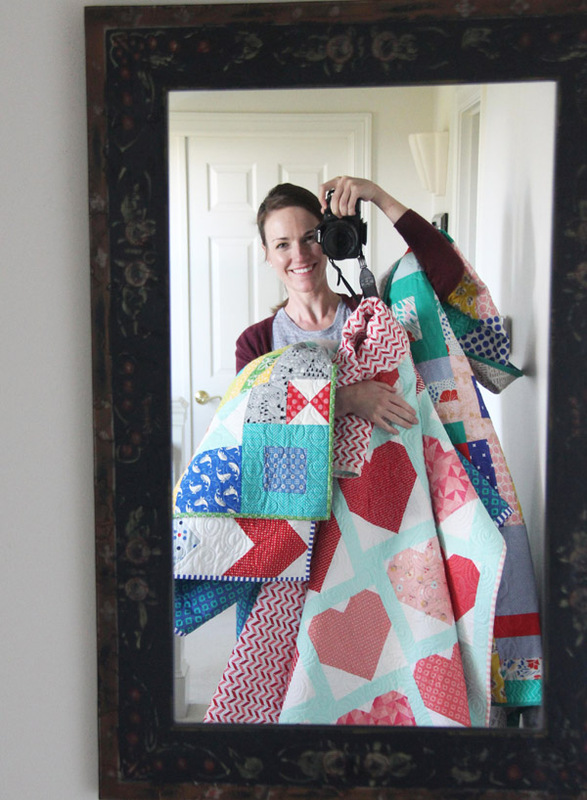 Love your heart quilt, and your selfie / self-portrait with quilts! I made a small drawstring bag (for a grown up girl) using your tutorial (thank you!) for a heart. Am sending you the picture. This is an adorable quilt!! Thank you for your many photos, inspiring designs, and quality content. I can always trust what you post and design!!! It has been a pleasure and privilege to read Cluck Cluck Sew. Hope there are many more years to come. On a further note it would be great to see a scattering of “boy’s” quilts–can I say this in the year 2017 when everything is supposed to be so gender neutral! I love blue and teal colours and would love to see you do something in this palette. Haha yes…I still really love making “boy” quilts…and most of the ones I would love for myself and I’m a girl so it counts as gender neutral right? Beautiful and cheerful quilt. It’s the size I almost always make my quilts. Love the pic of you. You look great. So young and energetic. How do you do it with all those kids and working too? Thankyou for all your hard work over the years. Yours was one of the first blogs I started reading and it has remained a favourite! When I went to start my own blog a couple of years ago I went back through your archives (in your old platform) and found your first posts – it gave me confidence ;-). Thanks for that! Amei! Parabéns pelo lindo trabalho!!! Love your blog, and your quilts! 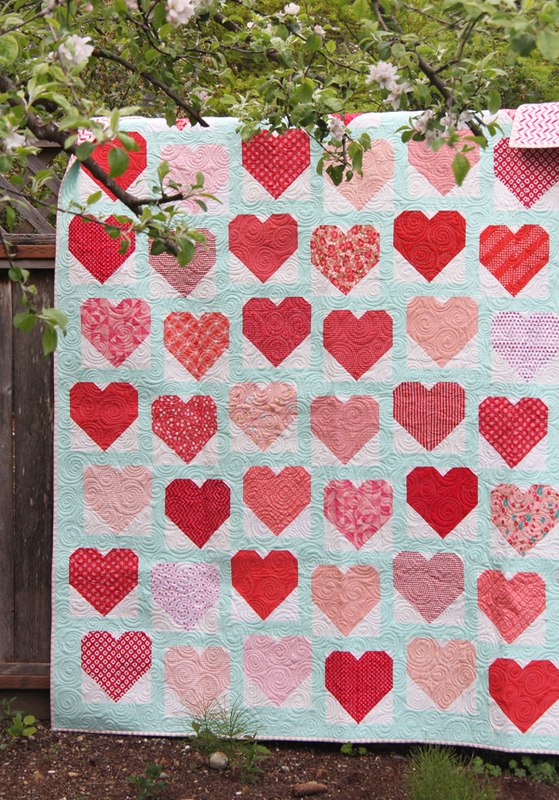 A heart quilt has been on my list for quite some time and yours is inspiration. That turquoise sashing really makes the difference. I love opening my email and seeing your name there. I just know it’s going to be something pretty! I just love the way that you set the hearts in the quilt. It is perfect! I enjoy your blog. Lots of fun things to make. I love how you shashed the heart blocks. I just lOVE that quilt! But I love ALL the quilts you make! Your blog is my absolute favorite! Thank you for 10 years!! I love this quilt so much – it was fun quilting it! Your blog always makes me smile….it’s so real! love you…..and here’s to the next quilty 10 years! Love your blog, your quilts & your patterns!!! Beautiful quilts, beautiful blog, beautiful YOU. The quilt is adorable, and thank you for continuing to write your blog, I love it. I love that quilt! I just recently started a blog. Hopefully it will still be around in 10 years! My kids are all young adults now except for my caboose that is 13. It still amazes me that I had more time to sew when they were all little! Once the older ones entered there teens I rarely had a minute at home; I was always driving someone to class or to work or somewhere! (Didn’t help that we never bought a car for them!) It is only now that two are out of the house and the oldest lives here and helps with chauffeuring the youngest, that I once again have time to sew—and start a blog! Having said that, I LOVED having teenagers! We had so much fun with them and their friends. There was so much laughter in our home—which made up for the empty fridge! Enjoy this time with them, as I’m sure you know, it goes by so fast. I’m just starting to get a taste of this…I’m literally never home and always going to and fro…but my kids are getting to be such fun (and sassy) ages and have great funny personalities. I’ll take less sewing time for that! I would suggest that you not get a car for them. Even though it is less convenient, driving them everywhere means time to chat in an informal setting, often with only one of them. I wouldn’t give up those hours and hours of individual time for anything, not even sewing! Great quilt! Love the photos! The backing looks super fun, also. Kathy is so great! Beautiful quilt! I just love seeing pics and reading about all your quilting projects. Happy 10 years!! I’ve loved your blog for years and have enjoyed watching both of our families grow- I have four kids too!! Love all your quilts- this one is beautiful! I found your blog just before Jane was born because of the your machine binding tutorial and now I find myself checking in every so often to see what pretty things you might be up to, and of course from time to time cute pictures of your children! I have 3 little ones myself and live in the Seattle area and a few times this winter during naps I would read a post by you that mentioned our weather — it has been a hard one! Today I am thinking of you because it’s so beautiful and I know you are enjoying this gorgeous sun break as well! I am very much a novice but you explain things in a very easy-to-understand way that I love! Thank you for such a beautiful corner of the internet! I’m in Poulsbo across the water from Seattle…maybe you’re close? :) Luckily the sun was out today!! Congratulations on your 10 years! I have just started my blog and hope that I get to 10 like you! Your blog is such an inspiration to me…thank you! Congratulations on 10 years! So many wonderful achievements in that time! I really love your selfie… it’s such a beautiful summary! Congratulations on 10 years!! 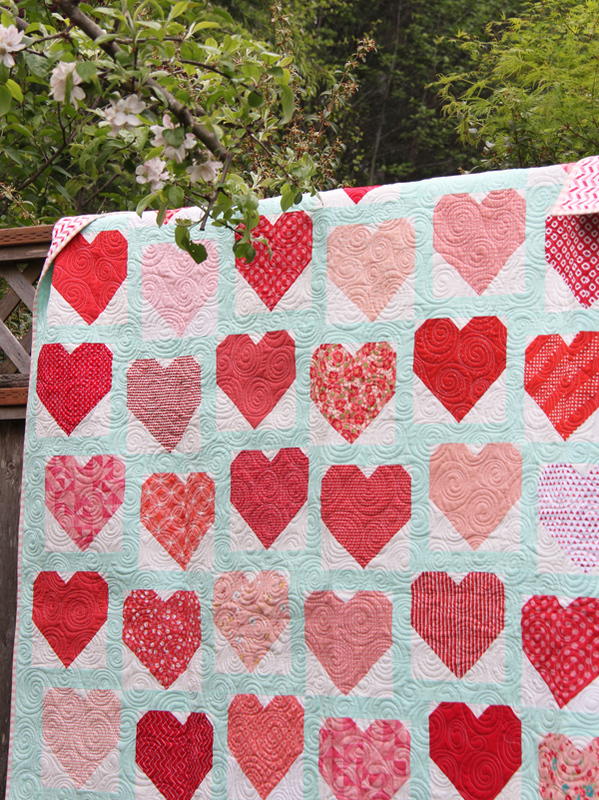 I love the heart quilt it’s beautiful. I enjoy reading your blog I have learned new things from your blog and I want to THANK YOU for that! By the way I enjoy the pics keep them coming! You take such lovely photos! I love the fresh palette for this quilt, and I think the soft aqua keeps it from being too sweet. The setting of the offset hearts give a lot of movement to the layout, too. Congratulations on 10 years of blogging! I love your site and look forward to posts from you. Happy mother’s day to you. I’ve followed and watched as your family has grown. What a great time in your life and you still have time to quilt. You keep me inspired.